February 1983. In the previous 12 months, the fortunes of Margaret Thatcher have been transformed by a British victory over the Argentinian invaders of the Falkland Islands. Flushed with pride, Thatcher implied she was reconnecting Britain to its glorious past, saying in a TV interview, “Victorian values were the values when our country became great.” Nostalgia as policy. Meanwhile, for Doctor Who fans, the 20th anniversary year was our opportunity to feel proud of the show. Given I was four years old at the time, I can’t remember whether it did or not. But I remember Turlough lurking in the corridors of Mawdryn’s spaceship. And I remember being slightly distressed when, over the end credits of The King’s Demons Part Two the continuity announcer said “And that’s the last in the series of Doctor Who”. Along with that, a Betamax tape of The Five Doctors (including the Children In Need introduction) and Peter Haining’s A Celebration almost permanently on loan from Pershore Library, 1983 is the very first year of Doctor Who of which I have clear memories. This is where my nostalgia begins. Mawdryn Undead, a story that takes place simultaneously in multiple times, strangely resembles the experience of being the fan of any long-running, well-documented programme: even as you’re watching an episode you’ve never seen, you bring decades of learned history to bear on it, spotting allusions and kisses to the past, always seeing patterns in things that aren’t there. And watching it 30 years later on DVD, having watched it again and read countless reviews or articles in the intervening time, it’s impossible at this stage to unpick event, experience and myth. I guess that puts me in similar position to my dad, watching this in 1983 having been a regular viewer since the Hartnell years. But to him, the show to him wasn’t a list of facts and story codes, more a jumble of snapshot memories, of moments that made a particular impression or that, for some obscure reason, stuck in the mind. My dad would undoubtedly know who the Brigadier was, he’d recognise the old Doctors in the flashback clips. He’d be familiar with the Time Lords and regeneration. He’d probably recognise Tom Baker’s coat. A lot of the continuity references in Mawdryn Undead would definitely work for him because they don’t assume any more knowledge than what anyone with even a vague notion of Doctor Who could remember. Importantly, given so many 1980s’ stories get a kicking for being ‘obsessed with continuity’, Mawdryn Undead gets its approach to the show’s past nearly completely right. There’s a reason the DWM Time Team picked this as the classic “watch this” sidebar for their discussion of School Reunion, and it’s not just because of the superficial similarity of an ex-companion unexpectedly turning up in a school. It doesn’t really matter who the ex-companion is – Sarah Jane could have been Jo Grant, and the Brigadier could have been Harry Sullivan who could have been Ian Chesterton. The point is to both root the show in its own past, and to bring that past into the present, a kind of crossover between time zones that, handled well, satisfies nostalgia and novelty. The current companions can raise an eyebrow at the Brigadier’s paternalism or Sarah Jane’s disco dog, and the old companion can bring their experience to bear, so that ultimately the audience is both delighted at seeing an old friend, and satisfied that the current team is a worthy successor. The celebratory tone is more important than the pedantic details of UNIT dating. Peter Grimwade, an underrated writer who always made something decent out of the nightmare briefs he was given, brilliantly reflects this in the structure of the story. Mawdryn Undead isn’t a story about the mechanics of time travel in the same way as Day of the Daleks. The most important reason to have two time zones is to get a second Brigadier aboard the spaceship to save the Doctor at the last minute. But it uses time travel as a metaphor for nostalgia, of being trapped by the past, afraid to face up to old mistakes, and ultimately of being able to move on from them. The1983 Brigadier is afraid of looking back at what caused his nervous breakdown, and so has lost touch with who he really is. Mawdryn and his undead crew are trapped forever by their ancient error of judgement, and have spent an eternity contemplating its consequences. The Doctor is the rogue element that connects the past, present and future, and so offers a way out of everyone’s’ predicament. Mawdryn is a fascinating character: unlike most Doctor Who villains, he doesn’t want to survive at any cost: he just wants to die. He wants the Doctor to commit euthanasia, to end “the agony of perpetuity”. It’s quite a disturbing idea for a family TV show, particularly given that Mawdryn is explicitly set up as a parallel to the Doctor – a renegade who stole something from the Time Lords a long time ago, who’s mistaken for a regenerated Doctor by the Brigadier and Nyssa, who wears the Doctors clothes, and ultimately wants to take the Doctor’s lives (he practically shares his last words, “Can this be death?” with the fifth Doctor). Immortality – at least immortality that means living forever without the hope of change – is shown to be a curse, and the Brigadier says he would have died of boredom if he’d just retired to grow vegetable marrows. Later in the season the Eternals and Rassilon are going to teach the same lesson. Life, Grimwade is saying, depends on renewal and change. What makes the Doctor unique is his ability to keep changing, not quite immortal, but not quite mortal either. Mawdryn Undead explicitly calls out his ability to regenerate and thus cheat both death and time as the thing that makes him a Time Lord. 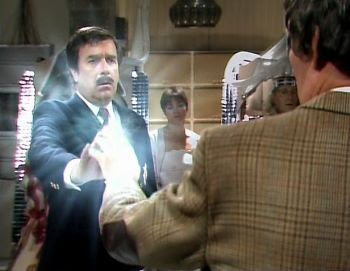 This then sets up the central dilemma in Part Four when Mawdryn, Tegan, Nyssa and the Brigadier all pester the Doctor to give up that ability to regenerate – to give up being a Time Lord – so that the mutants can die, and Tegan and Nyssa can escape. The new companion, Turlough is also seeking the Doctor’s death to save his own skin. We don’t learn what his crime is, or why he’s been exiled to Earth (this is not the first time the poor Brig has had to babysit an alien exile who goes around stealing classic cars and is desperate to escape the planet). Apparently Eric Saward thought the TARDIS was too cosy with Tegan and Nyssa, and so liked the idea of a companion out to kill the Doctor. Watching Mawdryn Undead knowing Peter Grimwade directed Adric’s swansong, you also get the impression that Turlough is an attempt to do Adric right – and it’s telling that at the end of the story the Doctor, Tegan and Nyssa think they’re going to have to race against time to save him from an exploding spaceship in Earth’s orbit, only to discover Turlough’s self-preservation is far stronger than Adric’s. Because Mark Strickson is a better actor than Matthew Waterhouse, and makes Turlough fascinatingly twitchy and conniving, he gets the benefit of the doubt, even if it’s questionable whether the fifth Doctor really did need another untrustworthy companion. Plus, Turlough’s actually not evil – his villainy is entirely inspired by the Black Guardian. When I looked at Frontier in Space, I suggested that Season 10 was effectively a year-long celebration spread over multiple stories, and not confined to the headliner The Three Doctors. That’s overtly the case for Season 20, where John Nathan-Turner wanted to bring back old monsters and villains for every story. That’s not entirely a bad idea, but whereas anyone who saw The Five Faces of Doctor Who or Kinda in the last 18 months could reasonably be expected to know of Omega and the Mara, the Black Guardian is a different proposition. He was last (and indeed only) seen for about two minutes, four years earlier. To be fair, he was mentioned several times subsequently, but in 1983 the question of whether the Doctor was wise to have disabled the randomiser in The Leisure Hive is probably not at the top of many fans’ lists of burning issues. This desire to follow up obscure details is the real failure of continuity in the 1980s, and the Black Guardian a curiously underwhelming villain to make the centrepiece of the anniversary. But that aside, this is great way to celebrate 20 years of Doctor Who. Steven Moffat has frequently cited this era as his favourite, and knowing that, it’s not hard to see how Mawdryn Undead might have percolated through his imagination: a story where the present and future interact with the past, that’s basically caused by a machine that’s gone wrong, requires a special ability of the Doctor to fix, and is ultimately resolved by a quirk of time travel: a story where the act of remembering is key. When we first meet him, the 1983 Brigadier has lost his memory of what happened in 1977. He’s even forgotten the Doctor. But at the crucial moment, when he’s faced with his 1977 self, despite the Doctor warning him of the dire consequences of the Blinovitch Limitation Effect, the Brigadier remembers what he has to do. So he reaches out to touch the past, and save the Doctor’s future. That’s the final lesson of Mawdryn Undead – remember the past, but move on from it: “move with the times,” as the Doctor says. Season 20 is great not because it wallows in nostalgia, but because it holds up the present to the past, and decides, after all, that it doesn’t want to go back. The anniversary year ends with the Doctor saying goodbye to his previous selves, and looking forward to beginning a new journey. Next Time: “Not even the Time Lords came this far. We should leave. We should go. We should really, really go.” The TARDIS encounters the last humans on Frontios.